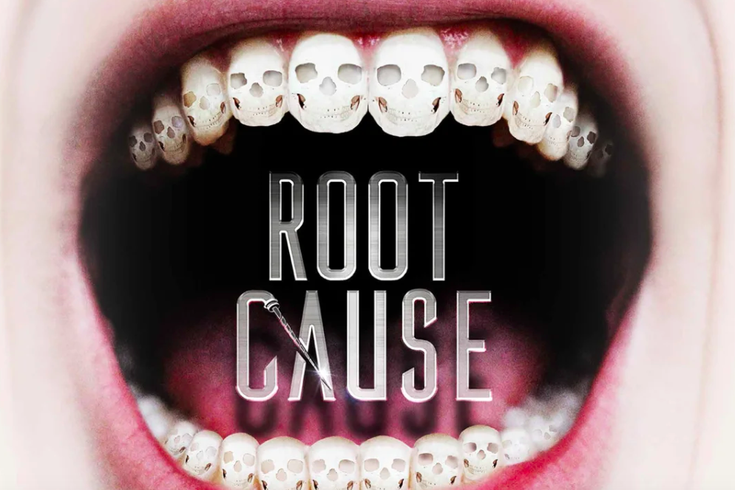 The promotional artwork for "Root Cause," a documentary that questions the safety of root canal procedures. A new documentary questioning the safety of root canals has drawn the ire of dentists and endodontists who say it is based on information long debunked. "Root Cause," released earlier this year, chronicles an Australian filmmaker's search to find the cause of his chronic fatigue, anxiety and insomnia. Eventually, Frazer Bailey blames his health problems on a root canal procedure he received years ago, thanks to the help of an obscure piece of scientific apparatus and some holistic dentists. Along the way, the 72-minute film claims that root canals cause an array of alarming health problems, including cancer, heart disease and chronic illness. It urges viewers to have any root-canal-treated teeth removed and replaced with a ceramic bridge or zirconia implant. One of the more eye-popping claims is delivered just nine minutes into the film. A holistic dentist asks viewers, "What if I could tell you that 98 percent of women who have breast cancer have a root canal tooth on the same side as their breast cancer?" But dental organizations across the United States – including both dental schools and membership groups – have rebuked the film's claims, noting they are not based on valid scientific research. The film's unsubstantiated claims hold the potential to "spread like wildfire" – not unlike the falsehoods passed along by anti-vaxxers, said Dr. Fred Barnett, chair of dentistry and program director of endodontics at Einstein Healthcare Network in Philadelphia. "Oh my god, if something like this were in fact the case, what a catastrophe," Barnett said. "No one wants to do a procedure that's going to cause anyone any type of harm or injury. No one is trying to cover up anything. "Let's look at the evidence and see what's out there. There hasn't been one valid medical or scientific study published anywhere that can show causation between having a root canal and developing cancer." Already, Barnett said, patients have requested to have symptom-free, root-canal-treated teeth extracted. "It's very difficult to combat these types of claims," Barnett said. "No one is going to allow a movie to be made, like a documentary, to go point by point against it. There's little that can be done." A POTENTIAL FOR PUBLIC HARM? Earlier this year, the American Association of Endodontists (AAE), American Dental Association and American Association of Dental Research requested Netflix, Amazon, Vimeo and Apple's iTunes remove the film from their platforms, citing a potential for public harm. Despite the opposition, "Root Cause" remains available on Amazon, Vimeo and iTunes. It is no longer available on Netflix, but it remains unclear why the streaming service removed it. Justin Lyons, the film's producer, claimed Netflix removed the documentary due to public pressure from dental associations. The streaming service did not respond to multiple requests for comment. A Vimeo spokesman said the company has left "Root Cause" available on its On Demand service because it is an open platform that allows creators to sell their videos. Vimeo On Demand does not solicit or screen for content and only removes content when it violates its service terms or guidelines. "The availability of any content on Vimeo On Demand (or elsewhere on our platform) should not be viewed as endorsement of any statement therein, spokesman Jordan Smith said in an email. Amazon and Apple did not respond to requests for comment. Root canals are a common dental procedure that save a patient's natural tooth and alleviates pain. They eliminate the infected pulp in a tooth and replace it with an inert material to prevent reinfection. The procedure typically costs hundreds of dollars. "Currently, about 25 million new endodontic treatments, including root canals, are performed each year, safely and effectively, with none of the side effects referenced in this movie," according to the AAE. The film's premise is "based on junk science and faulty testing conducted more than 100 years ago," that was first debunked in the 1950s, according to the AAE. Multitudes of scientific studies and peer-reviewed materials support the safety and efficacy of root canals. Lyons, who co-produced the film with Bailey, stood by the documentary, alleging that the dental groups are hiding the truth to protect mass profits. "'Root Cause' could be considered controversial by some – and by some I mean endodontists," Lyons wrote in an email. "But at the end of the day all we set out to do was make a film to start a conversation. Surely all this does is confirm the question, are root canals worth further scrutiny?" The film includes commentary by several alternative medicine physicians who have taken controversial stances on various health topics ranging from vaccines to Ebola treatments. Perhaps none are better known than Dr. Joseph Mercola, an author who runs a popular alternative health website that has decried Cheerios, fluoride, vaccines and, of course, root canals. Many of the claims included in "Root Cause" have circulated online for some time, including alleged links between cancer and the dental procedure. Barnett particularly took issue with the film repeatedly – and misleadingly – linking breast cancer to root canals, stressing that even the strongest correlations do not necessarily mean there is causation. In addition to having root canals, it's also highly likely that most breast cancer patients have been vaccinated, completed kindergarten and eaten cereal and milk during their lives, Barnett said. "If you want to know if there's a connection between root canal treatment and cancer, you look at the large population of patients who had root canal treatment," Barnett said. "Follow them up and see what percentage of those develop cancer. The answer to this question is that it's no different than what typically occurs in the general population." Essentially, he said, the filmmakers took a backward approach that any credible scientist would avoid. "If they actually wanted to tell the truth to the public, they would never frame it that way," Barnett said. "All it does is it creates an implication of very serious outcomes on a procedure that really has been shown to be incredibly safe and effective. I don't think this was by mistake. This was an intentionally deceptive way of presenting it."